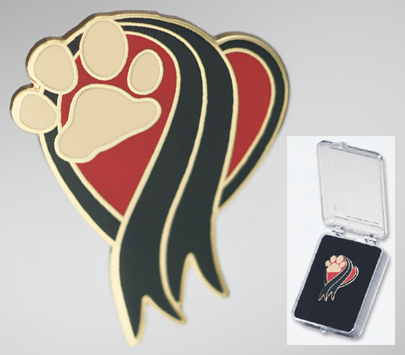 This Pet Memorial Pin is a gold plated heart draped with a symbolic black ribbon to help you or someone you know during the bereavement period. Filled with colorful enamel and backed with a locking clasp. Does not hold cremains. Surface is not engravable. Presented in a clear plastic box.